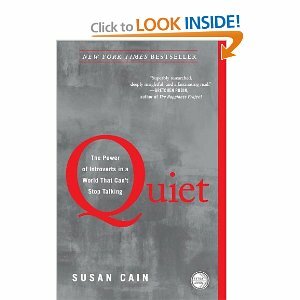 As mentioned previously, I just finished Susan Cain’s Quiet: The Power of Introverts in a World that Can’t Stop Talking. In the introduction, Cain separates the concepts of “introversion” and “shyness,” a distinction that was really crucial. For sure, many introverts are shy and many shy people are introverts, but introversion at its core is different: according to Carl Jung, who coined the terms “introvert” and “extrovert,” introverts gravitate toward the inner world of thought and feeling, they focus on the meaning they make of the world around them, and they “recharge their batteries by being alone.”  Cain adds to Jung’s characterization by including a constellation of traits that often co-occur in introverts: they prefer less stimulation, one-on-one and in-depth conversations, and expressing themselves in writing; they enjoy solitude, listen well, take few risks, avoid conflict, work best alone, think before speaking, and have a propensity to get intensely focussed. Many are also “highly sensitive,” the psychological term for people who feel emotions especially deeply and are more sensitive than the average person to physical stimuli as well as things like music, art, and poetry. Cain traces the history of the “extrovert ideal” in America, arguing that over time, more emphasis has been placed on charisma and vocal leadership, while the benefits of introversion have been overlooked. She also presents some evidence that collaboration may, in some cases, inhibit progress. The extrovert ideal is flawed and ignores so many contextual factors. Another important distinction she makes is between “temperament,” our innate, biologically-based behavioral and emotional patterns, and “personality,” the “complex brew that emerges after cultural influence and personal experience are thrown into the mix” . While altering our temperament is not an option, our personalities are shaped by our experiences in the world. Cain isn’t arguing that we’re born an introvert or extrovert and we’re stuck that way, but that we have the free will to affect how that temperament is manifested. She cites examples showing that introverts and extroverts think differently. For example, it seems that extroverts’ dopamine pathways are more active than introverts’. Greater dopamine responses cause extroverts to experience greater reward buzzes and to feel more pleasure and excitement than introverts. This, in turn, is likely to encourage them to take greater risks than introverts might take in search of a reward, which has been suspected as the underlying factor for many lost fortunes when the stock market crashed- people (extroverts) were continually taking risks with hopes of obtaining a reward that never manifested. This is one of many examples of how an introvert’s way of thinking might enhance extrovert-dominated environments. In the final section, Cain uses the differences between the two groups of people as a basis for concrete advice. First, she encourages introverts to act extroverted when it is necessary for something that’s important to them (like speaking in front of a group if it will further a career that they love). She offers suggestions to both extroverts and introverts for communicating and understanding each other, and tips for bringing out the best in introverted kids, both in the classroom and at home. I really liked a statement she made in boiling down her argument for readers: “The secret to life is to put yourself in the right lighting. For some it’s a Broadway spotlight; for others, a lamplit desk” . Pingback: The Power of Word Labels | Whats in a brain? Pingback: Questions | Whats in a brain?